Porous PSAs offer uniform, isolated pore structures to control flow and movement of liquids or gases. Component and material suppliers in the in vitro diagnostics (IVD) industry are facing pressure to develop technologies that address the demand for fast-performing, highly sensitive, accurate, and more affordable products in a short development cycle. Understanding the special needs of the IVD industry allows suppliers such as adhesive manufacturers to embrace this challenge through the development of enabling adhesive and coating technologies. This article discusses some of the design challenges related to formulating adhesives for diagnostics and how adhesives can bring added design benefits and enhanced capabilities to device manufacturers beyond simply bonding substrates together. Pressure-sensitive adhesives (PSAs) have been used for decades in a range of diagnostic device applications. In recent years, technology has evolved to create a more customized adhesive delivering enhanced performance capabilities. Today, PSAs are not only suitable for lateral-flow devices but also for many molecular diagnostic applications, including high-throughput screening, reverse-transcription polymerase chain reaction (PCR), cell culture, and compound storage. Device manufacturers primarily choose PSAs for their performance characteristics and because their continuous roll format enables efficient manufacturing for batch and in-line processing operations. The adhesives provide an immediate bond without the need for water, solvents, or heat that could potentially damage a device’s sensitive enzymes and reagents. Although several off-the-shelf medical-grade PSA products are currently available, OEMs will benefit most by working with a contract manufacturer that specializes in adhesive formulation and offers custom product capabilities that overcome the challenges of these specialized applications. Formulating adhesives for diagnostic applications is challenging, and adhesive manufacturers must first ensure component compatibility to the biological sample and assay. This responsibility becomes even more complex when considering the variety of available assays and how biomarkers or reagents can be combined as device designs broaden into new fields of disease detection. When considering adhesive or component materials for any test system, formulators must ensure that the chemistry of all raw materials is inert and remains inert to the chemistries of the device and specimen. The system must be free of residual volatiles (such as solvents; )and monomers, leachable components, and reactive materials to assure chemical compatibility.1 Processing components must also be considered. For example, most PSA systems are manufactured with a release liner to aid in processing. Silicone from the liner’s release coating can potentially be transferred from the adhesive to the IVD device, causing contamination that may affect growth in cell culturing applications. Tight tolerances for adhesive and substrate thickness control within product rolls and from lot to lot are critical for microfluidic devices and lateral flow applications. Any thickness variations can affect sample volume and test results. PSAs are a proven component in lateral-flow immunoassays that are used in many disposable IVD devices and biosensors. PSAs offer precise and accurate bond lines that improve the reproducibility of these devices, so one or more layers of PSA tape product may be used to bond, laminate, or assemble components within a test strip. For example, in microfluidic devices and biosensors, a spacer tape defines the height of the microfluidic channels, which are formed by die- or laser-cutting, while the lid of the channel is made of another adhesive tape or a hydrophilic film.3 Adhesive thickness and tight tolerances can be monitored and maintained by integrating sophisticated vision systems and state-of-the-art online coating controls into the manufacturing equipment train to ensure product quality. Adhesive migration, known as cold flow or creep, is one of the many design challenges adhesives manufacturers must address in IVD device design. The delicate balance of an adhesive’s viscoelastic properties for proper laminating and cutting can have serious effects on manufacturing efficiencies if the formulation is not well-suited for an application’s production processes. During conversion, a roll of adhesive may be processed in a number of ways, including high-speed laminating, slitting, sheeting, guillotining, and laser, rotary, or flatbed die-cutting. Although the PSA format offers many manufacturing efficiency benefits for high-speed conversion, the viscoelastic characteristics can also present challenges. If the adhesive is too hard, it will provide clean cuts but less-than-optimal bonds for laminating. If the adhesive is soft, it will laminate well to other component parts. However, residue may adhere to machinery blades during conversion, affecting the precision of individually cut parts. When adhesive builds up on the blades, the result can be increased cutting cycle time, reducing overall conversion throughput.4 Additional loss of productivity occurs when cutting equipment is shut down and dissembled for manual removal of adhesive buildup on the cutting blades. Small sample volumes and quantities of biomarkers are influencing the design of devices that use small capillary channels. As a result, the viscoelastic properties of the adhesives used in device designs with large sample flows may not be suitable for smaller-channel designs. In these instances, a dual-stage UV-curable PSA is a good substitute. It cures in less than one second without the risk of damaging sensitive components. Compare that to heat activated-systems, which require pressure and dwell time for bonding. The uniqueness of this tape construction allows it to function like any other PSA for in-line processing with high-tack properties for bonding, laminating, and assembling components within an IVD device. Once assembled, the laminated construction is briefly exposed to UV radiation, which further cross-links the adhesive and makes it more cohesive to eliminate the risk of cold-flow. The cohesive strength of the UV-cured adhesive prevents cutting blade gumming with low shrinkage. Although the cured adhesive presents increased cohesive strength, the overall system remains flexible. Two approaches can improve the flow of biological fluids through a diagnostic device. One approach is to increase the surface energy of the substrate with various surface treatments. A second approach is to reduce the surface tension of the biological fluid, which can be accomplished through the incorporation of a hydrophilic PSA. Adhesives may be formulated with a range of hydrophilic and hydrophobic capabilities to control fluid flow in a device while also providing increased design flexibility using a small biological sample. When an adhesive’s surface is hydrophilic, it reduces a fluid sample’s surface tension, improving wicking consistency and enabling rapid fluid transfer from the inlet port to a remote reactant area for fast test results. Hydrophilic PSAs may also be used as a wicking surface that allows increased separation between the sampling port and test reagents to reduce the risk of chemical interference. Adhesives with tailorable fluid transfer properties are available in a number of forms, including PSA, heat seal, and film coatings. These forms make them an attractive material choice for lateral flow, microfluidic, microtiter plates, and point-of-care devices that require good bonding to a variety of substrates (see Table I). Table I. Hydrophilic adhesives offer tailorable features. PSA manufacturers are faced with a long list of chemical compatibility and physical bonding challenges when formulating products for diagnostic devices. In addition, many biological testing applications rely on diagnostic determination by using fluorescent emissions. Careful consideration must be given to materials when selecting cover tapes for PCR, real-time PCR, microfluidic, biochip, microarray, and microwell applications. Any interference or background fluorescence from an adhesive coating or accompanying film carrier can affect the detection of optical characteristics. 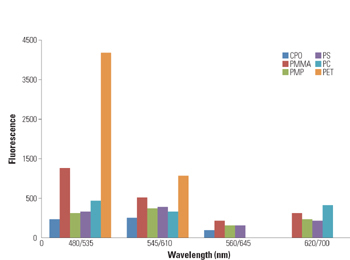 Sealing or cover layers must exhibit little or no spectral emission at the biomaterial detection wavelength (typically 400–800 nm). Low fluorescent film substrates include materials such as polyolefin (PMP), cyclic polyolefin (CPO), polyacrylates (PMMA), polycarbonate (PC), polystyrene (PS), and polyethylene terephthalate (PET) (see Figure 1). From an adhesive standpoint, chemistries with high levels of acrylic acid should be avoided, and low coat weights should be used. Figure 1. The effect of excitation energy on the fluorescence of various substrates. Conventional preparation techniques for test strips, such as spraying, coating, or striping, can result in the costly loss of reagent. They can also limit the effective distribution of active components throughout a membrane or conjugate pad. Dissolvable films are formulated as a homogeneous mixture of a film former and reagent(s), so consistent dispersion of the active component is an inherent benefit of the film technology, translating to increased yield and reduced costs for device manufacturers.11 The film is provided in a continuous reel and may be cut into any size or shape to fit the end product design. Each precisely die-cut film component is a premeasured single dose that is easier and safer to handle than aqueous solutions of reagents. Higher dose concentrations can be obtained by increasing the loadings within the film itself or by increasing the film’s overall mass and thickness. Reagent-loaded dry films do not require refrigeration or preservatives. Increased stability of the reagent when it is integrated into a film format results in less waste and requires fewer resources for device manufacturers to properly store and handle the sensitive and fragile reagents. For diagnostic applications that require a controlled and timed reaction, dissolvable films may be incorporated as isolation barriers formulated with longer disintegration rates. Alternatively, the films may be used in multiple-layer constructions and vertical flow devices that contain or separate one or more reagents for their controlled release when exposed to an analyte within a device. PSAs provide custom bonding with added performance benefits in electrochemical sensors, such as blood glucose or lactose test strips, or biofeedback devices that incorporate an electrical current or potential for diagnosis. Electrically conductive PSAs enable small and thin effective bonds because they not only bond components together, but also provide the added functionality of supplying pathways for electrical signals. By eliminating the need for other conductive elements, electrically conductive PSAs present options for simplifying electronic component designs. Carbon- and metal-filled adhesive matrix. Carbon and silver compound adhesive. Adhesive-embedded composites for x-y versus z-conductivity control. A number of factors are driving IVD manufacturers to reduce the cost of their current products and develop next-generation devices for current and new applications. As device manufacturers maneuver through shortened product development cycles, they turn to their material suppliers for the latest technologies for enhancing product performance and value. Suppliers face many technological challenges in developing innovative new products and efficient and reliable manufacturing processes that produce high-quality products that meet or exceed regulatory requirements. Custom adhesives manufacturers are uniquely positioned to develop and implement technologies that provide reliable bonding for a multitude of IVD testing platforms, and deliver enabling technologies to address the challenges IVD manufacturers are facing today and in the future. 1. WG Meathrel and J O’Mahoney, “Customized Adhesive and Coating Technologies Enable Drug Delivery Methods,” Pharma, September (2009): 20–23. 2. WG Meathrel and R Malik, “Advanced Pressure-Sensitive Adhesives Enable Advent of Next-Generation IVD Products,” European Medical Device Technology 2, no. 1 (2011): 19–21. 3. P Hilfenhause and T Meigs, “Pressure-Sensitive Adhesive Tapes for IVD Applications, 16.2” IVD Technology (2010): 33–38. 4. E Lakitosh, “Die-Cuttable Adhesive Development,” Internal company document. Adhesives Research, Glen Rock, PA.
6. W Meathrel et al., 2002, Hydrophilic diagnostic devices for use in the assaying of biological fluids, U.S. Patent 7,476,533, filed April 19, 2002, and issued Feb 25, 2004. 7. R Malik, R and K McKinney, Porous pressure-sensitive adhesives and tapes, U.S. Patent 60/978,591, filed October 8, 2008, and issued April 9, 2009. 8. R Malik, “Porous Adhesive Technology for Diagnostic Applications,” IVD Technology 15, no. 2 (2009): 27–32. 9. R Malik, “Porous Pressure-Sensitive Adhesives,” European Medical Device Technology 1.2, (2010): 41–43. 10. W Meathrel and C Moritz, “Dissolvable Films and Their Potential in IVDs.” IVD Technology 13, no, 9 (2007): 53-58. 11. W. Meathrel et al., Disintegrable films for diagnostic devices, U.S. Patent 7,727,466, filed Nov. 21, 2008, and issued June 1, 2010. 12. D Hariharan, “Electrically Conductive Adhesives Charge Forward,” Design Fax 4 (2009); available from Internet: www.designfax.net/news/archive/04-28-2009/stories/feature-1.asp#. William G. Meathrel, PhD, is senior scientist at Adhesives Research Inc. (Glen Rock, PA). Ranjit Malik, PhD, is group leader of core technology at the company.